Dempo SC thrashed Salgaocar FC 4-0 in the finals to clinch the GFA U-14 League for the 2017-18 season. Dempo SC started in the same attacking fashion as they did in the semi-finals against Sporting Clube de Goa and took just ten minute to take the lead when Shreyash Naik set up Rohit Shirodkar who scored with an easy tap in. In the 16th minute captain Shreyash Naik had a great chance to double the lead but his powerful grounder was saved by the Salgaocar Keeper Bob Raj. Dempo SC scored their second goal in the 22nd minute when Aman Kumar made a good run from the right flank and delivered a beautiful ball to Shreyash Naik who made no mistake to score his first goal of the evening. Dempo SC went into the lemon break with a 2-0 lead. Just two minutes into the second half, Dempo SC’s Sherwin Abranches shot a powerful volley from 35 yards which was brilliantly saved by the Salgaocar FC keeper. In the 39th minute Shreyash Naik completed his brace when he flicked a header over the keeper off an assist from Dwayne Neto. Dwayne Neto then got his name on the score sheet in the 48th minute, to seal a memorable evening for Dempo SC. Dempo SC finished the league with an unbeaten record scoring mammoth 62 goals and conceding just 2. Dempo SC Head Coach Remus Gomes was delighted with the performance of his boys and lauded the efforts of his technical staff and players. “The team played brilliantly throughout the tournament and credit goes to my technical team and the players for such a great season. We hope to keep the flag of Goan football flying high in Kolkata where we will play in the U-13 Youth League next week” said Remus. 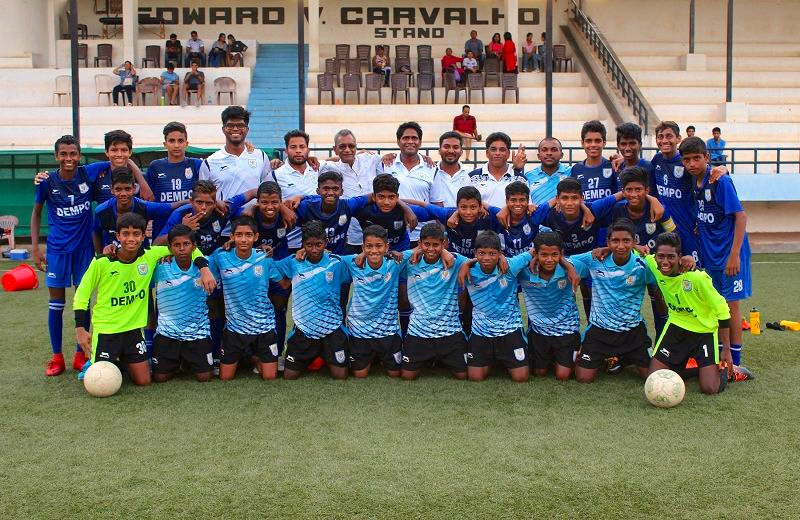 The team will leave for Kolkata on the 27th April to play in the Final round of the AIFF U-13 Youth League where they have been drawn to play against big names like Mohammedan Sporting.